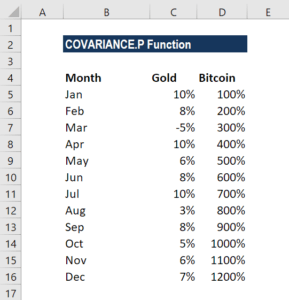 What is the Covariance Excel Function? 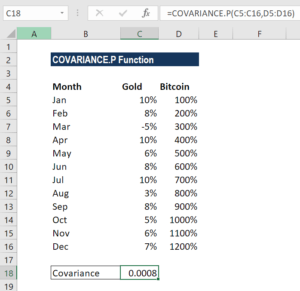 The covariance Excel function is categorized under Statistical functionsFunctionsList of the most important Excel functions for financial analysts. This cheat sheet covers 100s of functions that are critical to know as an Excel analyst and it will calculate the joint variability of two random variables, give two sets of data. Suppose as a financial analystFinancial Analyst Job DescriptionSee a real Financial Analyst Job Description including all the skills, experience, and education required to be the successful candidate for the job. Perform financial forecasting, reporting, and operational metrics tracking, analyze financial data, create financial models, we wish to determine whether greater income accompanies greater levels of education in a population or not. In such a scenario, we can use the COVARIANCE.P function. it was introduced in MS Excel 2010 to replace COVAR, with improved accuracy over its predecessor. If the given arrays contain text or logical values, they are ignored by the COVARIANCE in Excel function. The data sets should not be empty, nor should the standard deviation of their values equals zero. 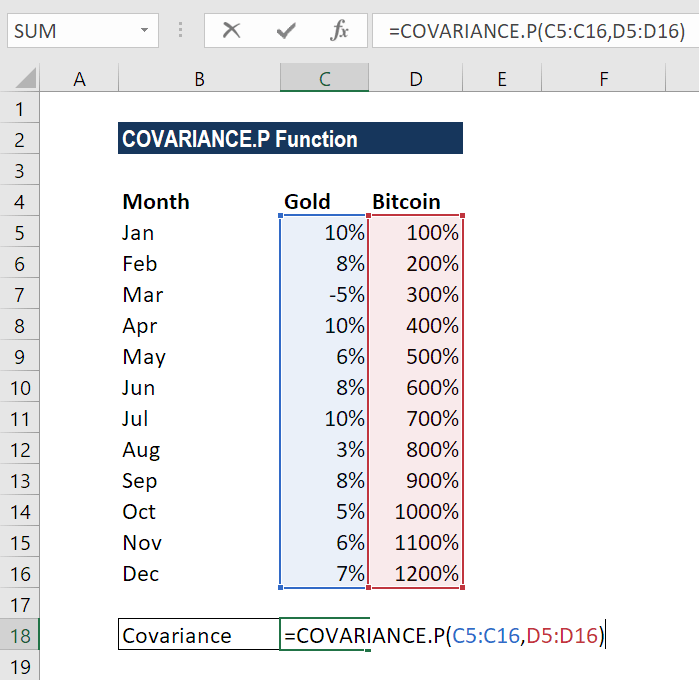 We wish to find out covariance in Excel, that is, to determine if there is any relation between the two. The relationship between the values in columns C and D can be calculated using the formula =COVARIANCE.P(C5:C16,D5:D16). The formula gives the result 0.0008, which indicates a negative correlation between the two sets of stocks. The function is available from MS Excel 2010. However, it is simply an updated version of the COVAR function, which is available in earlier versions of Excel. #N/A error – Occurs if the given arrays are of different lengths.